The last month and a half has flown by more quickly than I could have ever imagined. It seems like just yesterday it was the first week of February, and Nick and I were off to on a quick weekend trip which included a brief 6 hours in Riga, Latvia. While researching Riga, I made a list of all the things I wanted to do and see, and then prioritized these items. Through this planning, we were able to do and see so much! It seemed like Riga was a popular destination to spend a short amount of time. Many people had layovers in Riga for 6-8 hours, and wanted to know if it was worth it to head into the city. In my opinion, yes! 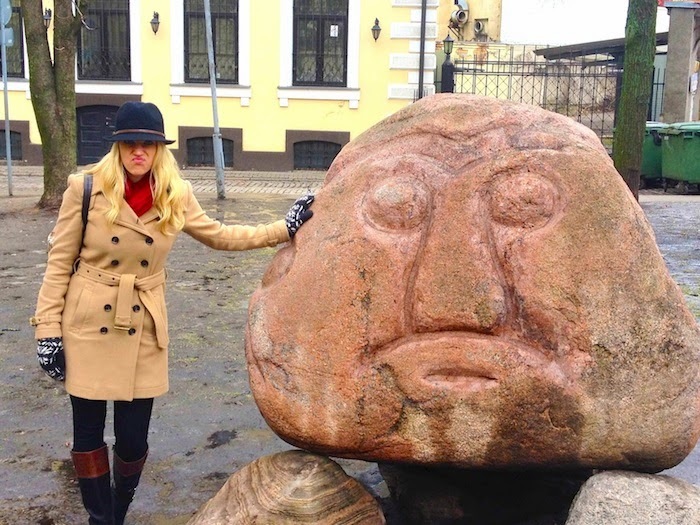 Today, I'll take you on a quick tour of what to do for 6 hours in Riga! The first thing Nick and I did was hop in a taxi and ask to be dropped off at the House of Blackheads. 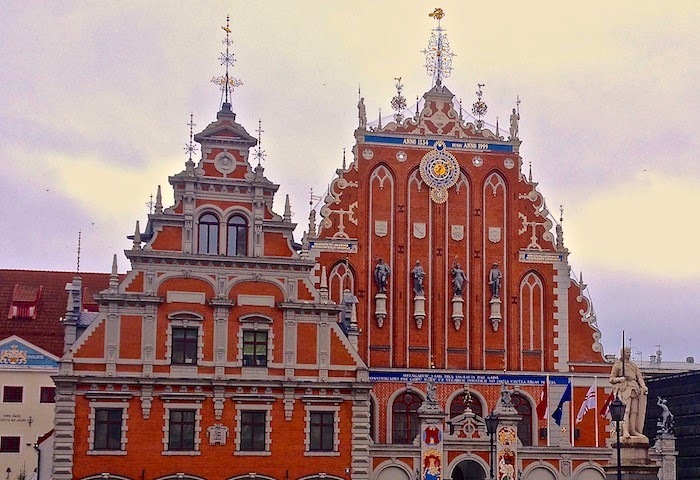 The House of Blackheads is one of the most famous sights in Riga, and is also fairly central to all of things you should do in a few hours in Riga. Our taxi driver dropped us off, we hopped out, looked around… and I wasn't seeing the House of Blackheads. Rather, there was this peculiar building with two cats perched on the spires. After a quick moment of laughter, I explained to Nick that our cab driver must have misheard us, thinking we wanted to go to the House of Black Cats. 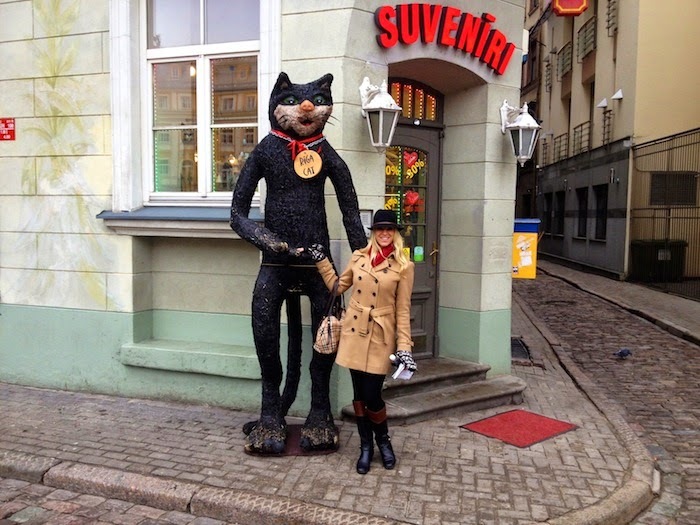 Nonetheless, the Cat House is a somewhat famous fixture in Riga…legend has it that the two black cats were placed to face the either the Riga Great Guild or the Riga Town Hall, as the owner of the house was in a dispute with these organizations. Thus, the cats 'look' angry, with arched backs and raised tails. After explaining the House of Cats to Nick, we located ourselves on the map and headed on to our next sight. As we were walking, we came across a strange statue park- as you can see above! While in Riga, I would recommend walking by the House of Cats, but there is no need to spend significant time there. 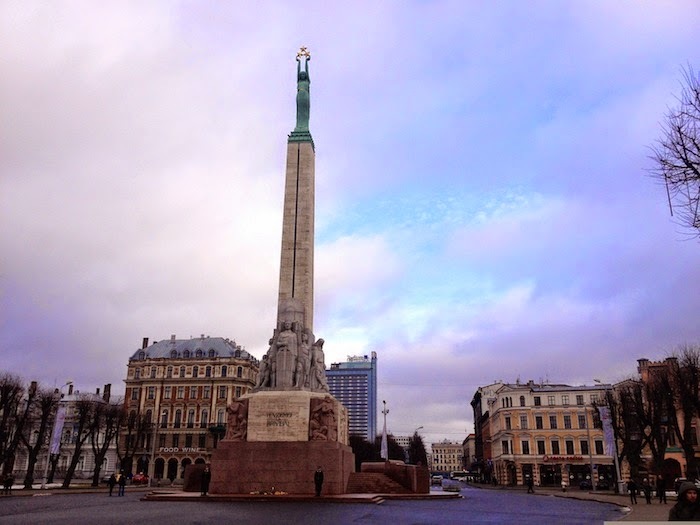 We decided to walk towards the Freedom Monument, which is located a few minutes walk away from most of the Riga destinations. After viewing the Freedom Monument, I would recommend passing by it and stopping at the Radisson Blu sky bar. While I did not have the opportunity to stop here, the Skyline Bar is 26 floors up and offers food, beverages, and views overlooking the city of Riga. Once done at the Skyline Bar, walk back towards Old Town, stopping for a moment to view the Powder Tower, featuring the Latvian War Museum, and the Latvian National Opera House. Walking back towards the House of Blackheads and Old Town Riga, you will go past the Riga Cat. He is one of my favorites from visiting Riga! The walk from the Freedom Monument to the House of Blackheads is 10-15 minutes, and worth it just to experience some of the old streets and views in Riga. No trip to Riga is complete without seeing the House of the Blackheads. The House of the Blackheads was built in the 14th century for the the Brotherhood of Blackheads, a group of unmarried German merchants. It is one of the most famous sights in Riga, and is conveniently located near the Town Hall Square, Riga Town Hall, and St. Peter's Church. 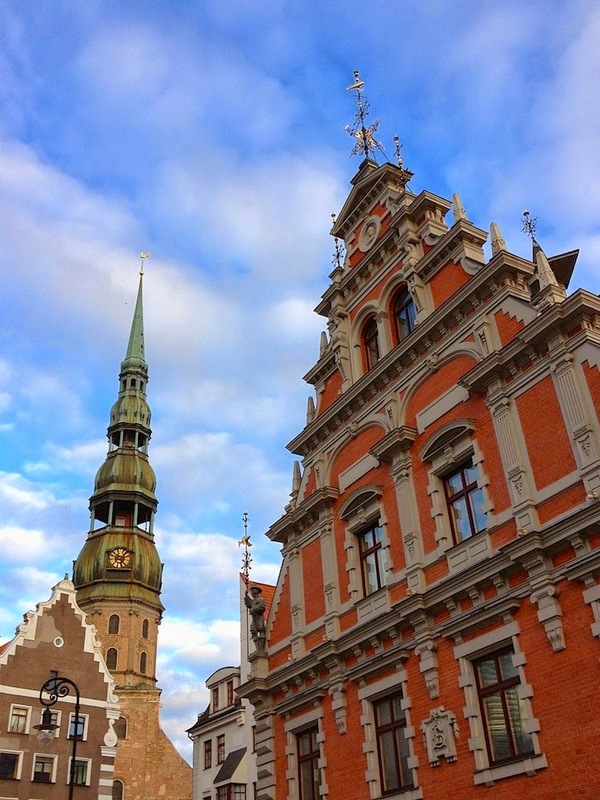 Riga Town Hall and The House of the Blackheads are located across from each other. 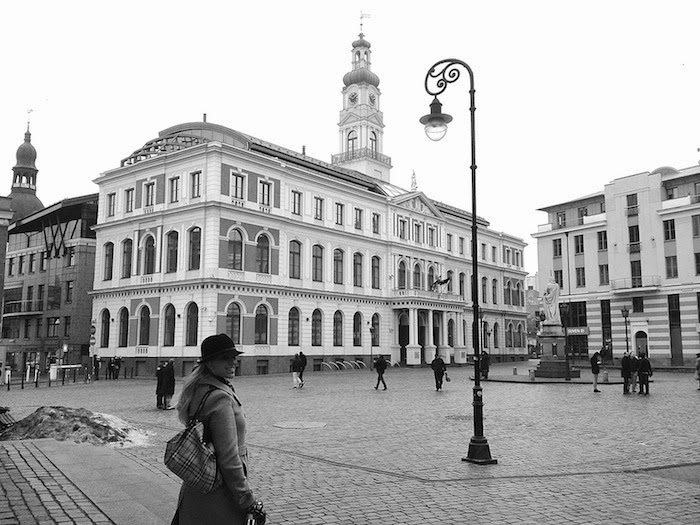 Also near this square is the Museum of the Occupation of Latvia. The museum covers the 50-year occupation of Latvia by the Soviet Union from 1940 to 1991. During the occupation and WWII, Latvia lost about 1/3 of it's population. Unfortunately, the Museum of the Occupation of Latvia was closed for repairs while Nick and I were visiting Riga- but with so much historical significance, I would maintain that any visitors must check this museum out. Next on the list of to do in Riga is heading to St. Peter's Church and checking out the views of Riga! As you can see above, St. Peter's Church peeks out from behind the House of the Blackheads. 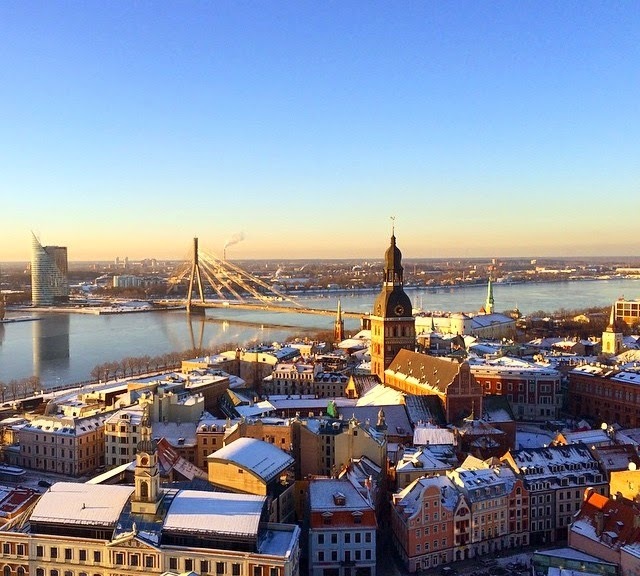 One of the highlights visiting Riga is checking out the views of the city from St. Peter's Church. All of my pictures can be seen here, but plan on spending 30-45 minutes in the church and checking out the city from above! After checking out Riga from above, walk towards the Three Brothers and the Riga Castle, both sights to see for a short amount of time. 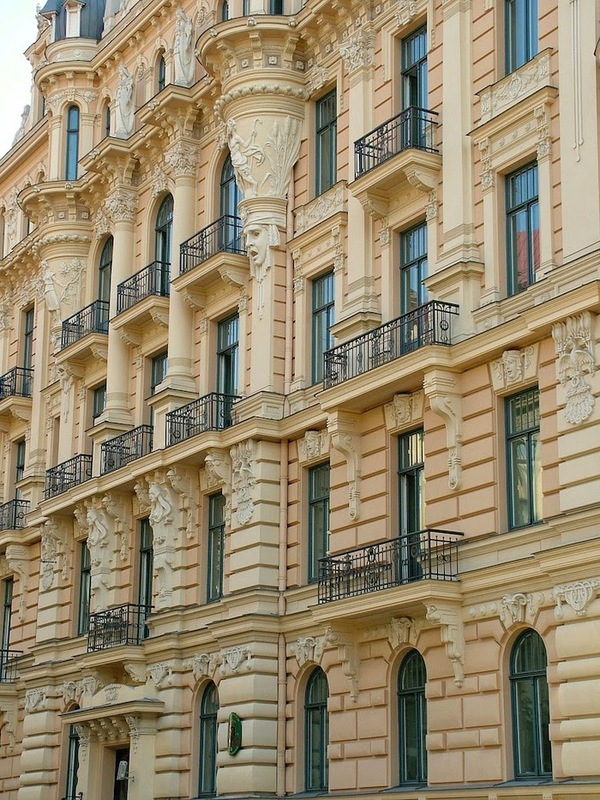 Throughout Riga, you will consistently be met with beautiful architecture. Take a stroll along Albert Iela (Alberta Street) to see some of the most famous art nouveau. An astonishing 40% of Riga is decorated in Art Nouveau, which is why with any amount of time spent in Riga visitors are guaranteed to see some beautiful buildings. Art Nouveau is especially important to Latvian history, as it was the cause of many Latvian artists becoming famous. After a busy day walking and exploring the city of Riga, with any leftover time I would recommend sitting in a quiet pub and enjoying a Latvian beer, or in my case glass of 'champagne'. Despite only having six hours to spend in Riga, I felt I was able to get a great feel for the city while still having some time to relax over lunch and drinks. The city is fairly small, and many of the attractions are located very close together which is a great benefit if you only have a short amount of time to spend in Riga. If you are going on a quick trip somewhere, check out my 7 tips to maximize your time while traveling. What is the shortest amount of time you have ever spent in a city, and did you feel like you got a good feel for the city while there? It definitely looks like you made the most of your limited time in the city! And I just can't get enough of those views! My great-grandfather was actually taken to a Siberian work camp, though he was German. He was mayor of a small town. I don't know why he was taken but I'm assuming he must have had some strong anti-communist beliefs and been outspoken about them. They never found out what happened to him and he was declared dead like over ten years later. Sara, that is such an interesting story- it would have been so cool to hear his stories about why he was taken and the work camp. I'm sorry to hear it didn't have a happy ending with him returning home to family! Gorgeous! Riga is like the best of Russia & Europe combined it seems like! Thanks Polly! I've never been to Russia (yet!) but definitely hoping to one day. My husband noticed a ton of similarities to Russia though. Wow you packed in a lot, we stayed for 3 days and still had more stuff we wanted to do but didn't. A seriously under-rated city. I totally agree! What was your favorite part?